Obama to boxing legend: "Happy birthday, champ." A glimpse of the legendary match-up between Muhammad Ali and Joe Frazier at Madison Square Garden in 1974. 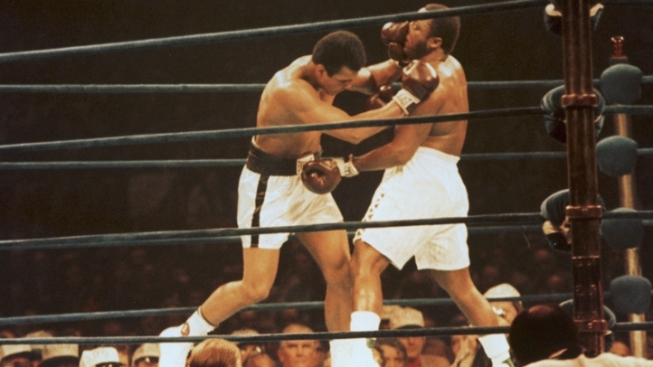 Ali famously beat Frazier. Muhammad Ali turned 70 last month, but some of the world's most famous people are still wishing the boxer known simply as "The Greatest" a happy birthday. "Happy birthday, champ," President Barack Obama told Ali through a video message, saying he wished he could have attended a swanky dinner gala in Las Vegas featuring some of the biggest names in sports, film, television and music. "As a fighter, you were something spectacular," Obama said. "You shocked the world, and you inspired it, too. And even after all the titles and legendary bouts, you're still doing it." The gala's 2,000 attendees were there to celebrate Ali's life and generate millions of dollars for brain research, a mission Ali's family says is important to him in part because of his nearly 30-year battle with Parkinson's disease. Football great Jim Brown said Ali represents the greatest of America, because at one time people only recognized his athletic ability and didn't like what he had to say. That changed over time, he said. "America started with slavery and ended up with a black president," Brown said. "Muhammad Ali was a part of that ... a big part." Ali's wife, Lonnie Ali, told the star-studded crowd that her husband's greatest wish has always been to inspire and help others. She said he feels that his life really began when he retired from the ring. "Muhammad's gift of inspiration is timeless, and now more relevant than ever," she said after being introduced by music icon Quincy Jones. Lonnie Ali introduced a video montage of her husband's life, including clips from his work with children. Guests arriving on the red carpet included football great Franco Harris, supermodel Cindy Crawford, actor Samuel L. Jackson, Ali's children and grandchildren and Chuck Wepner, who fought Ali in 1975 for the heavyweight title and lost. "I would go anywhere in the world for Muhammad Ali's birthday," Wepner said. One of Ali's daughters, Rasheda Ali, said the gala is a chance for friends, family and A-listers who look up to her father to show their respect for his life and legacy as a humanitarian. In return, she says he'll be honored to see them there. "He has not left that need to help others," Rasheda Ali said. "That's one of his core values — his charity and his giving." The gala — with tickets starting at $1,500 per plate — was held at the MGM Grand, the site of most of boxing's major fights the past two decades. Famous faces converged on the 160 tables adjacent to two rings and a stage — Terrence Howard, Anthony Hopkins, Manny Pacquiao, Common and Lenny Kravitz, among others. They planned performances and tributes to a fighter who went 56-5 in the ring with 37 knockouts and became perhaps the most famous athlete ever because of his personality and willingness to publicly stand up for his beliefs. Tennis great Andre Agassi said Ali has shown the world that each person has a duty — regardless of their occupation — to live for more than him or herself and help others. "What he did with his platform was unparalleled and the impact he's had as a result, we still feel to this day, which is why we're all out here tonight," Agassi said. "We're grateful to what he's done. He's been a leader — we're also challenged and charged with a duty of figuring out a way to do more." Ali has lived with Parkinson's disease for nearly 30 years, a degenerative brain condition that some doctors say can be brought on by punches to the head. The gala raised funds for the Cleveland Clinic Lou Ruvo Center for Brain Health and the Muhammad Ali Center in Louisville, Ky., a cultural attraction that celebrates Ali's life and pushes educational goals on a wide range of topics for adults and children. Larry Ruvo, chairman of the clinic's fundraising arm, Keep Memory Alive, said he's not sure whether the fundraiser will exceed its record of $27 million, but he hopes so. The gala's auction includes some items that only an A-lister or others with incredibly deep pockets could possibly afford. The top item was Ali's gloves that he used to fight Floyd Patterson in 1965, a bout he won by knockout in the 12th round. "If it's $100, great, $100,000 would be better," Larry King said in trying to drum up bids. Magician David Copperfield auctioned off a four-night trip to his set of 11 private islands in the Bahamas for $300,000. Boxing promoter Bob Arum said during a pre-gala reception Friday night attended by celebrities including Hopkins and Larry King that Ali will go down as one of the most important Americans in history. "Without Muhammad Ali, there wouldn't have been an Obama," he said. "There wouldn't have been a mixed-race president." ABC and ESPN plan to air the gala on Feb. 25.